Spinal anesthesia is a commonly performed method in caesarian section operations because it induces rapid and effective anesthesia and is technically easy to perform. Furthermore, it is advantageous as it helps to avoid unsuccessful intubation, aspiration of gastric content, and use of depressant agents. However, despite these advantages, it produces inadequate post-operative analgesic effects . Currently, treatment of postoperative pain relies mainly on opioids, Non-Steroid Anti-Inflammatory Drugs (NSAID), and local anesthetics administered via regional techniques . Although opioids provide efficient analgesia, their serious side effects including respiratory depression, sedation, postoperative nausea and vomiting, urticaria, urinary retention, ileus, and constipation which may cause prolonged hospitalstay . NSAID’s that seem to be an alternative to opioids, on the other hand, may cause nausea, dyspepsia, peptic ulcer, perioperative acute renal failure, bleeding disorders, bronchospasm, and anaphylactic reaction . Transversus Abdominis Plane Block (TAPB), described as administration of local anesthetic between the fascia of internal oblique and transversus abdominis muscles, is frequently used in postoperative pain management following gynecological, obstetric, and other surgeries [5,6]. In previous studies, TAPB has been generally applied to patients who underwent Caesarian section under general anesthesia. However, spinal anesthesia is the most commonly preferred method for Caesarian section operations. Therefore, in our study, we aimed to evaluate the analgesic efficacy of Transverses Abdominis Plane Block (TAPB) performed with the purpose of postoperative analgesia in patients who underwent caesarian section operation under spinal anesthesia. The study protocol was approved by the Local Ethics Committee for Human Research (University Medical School Ethical Evaluation Commission Chairman, 02.09.2014/14/12) and ACTRN (ACTRN12616000719437). The study is a randomized controlled, and parallel clinical trial. Following the obtainment written patient consent, a total of 60 patients aged between 18-45 y, who had planned to undergo elective Caesarian section at term pregnancy and were categorized as ASA I-II risk group, were enrolled in this study. Study exclusion criteria are as follows: use of drugs acting on cardiovascular system, congestive heart failure, diabetes mellitus, hematological disorder, chronic pain syndrome or recent use of analgesics, obesity (body mass index>30 kg/m2), contraindications for spinal anesthesia (sepsis, bacteremia, regional skin infection, hypovolemia, coagulopathy, therapeutic anti-coagulation, elevated intracranial pressure, patient’s refusal), previous abdominal surgery, recurring caesarian section, placental anomalies, eclampsia, preeclampsia, and allergy to local anesthetics. Patients were randomly (allocation ratio was 1:1, sealed envelope method) categorized into two groups based on the method of postoperative analgesia. Group TAPB (n=25): Patients in this group received analgesia provided with single-dose Transversus Abdominis Plane Block (TAPB) (single bolus administration of 0.25% bupivacaine, 20 ml to each side). Group C (n=25): Patients in this group did not receive any additional application following spinal anesthesia. Patients did not receive premedication before operation. Following their transport to the operation room, patients were monitored with Electrocardiography (ECG), Noninvasive Arterial Pressure (NIAP), and peripheral oxygen saturation (SpO2). An I.V. line was placed using 20 G branule, and ringer lactate solution was infused as 10 ml/kg within 20-30 min. Patients in groups TAPB and C were made to sit on the edge of the operation table and were requested to bend their head down. A foot rest was placed under their feet, and the patient was positioned to cuddle the pillow placed over their chest. Skin antisepsis was provided with alcohol based povidone iodine solution, and the area was covered with a sterile dressing. In both groups, 24 G “Quincke” spinal needle was used to access spinal epidural space, approaching from the median line at L2-3, L3-4 or L4-5 interspace. During entry, orientation of the needle was kept parallel to dural fibers. After observing the free flow of cerebrospinal fluid, 2-2.5 ml (10-12.5 mg) of 0.5% hyperbaric bupivacaine (Marcaine heavy 0.5%, 4 ml, Astra Zeneca, İstanbul, Turkey) was injected, and the patient was positioned supine. After positioning the patients in the supine position, the level of sensorial block was assessed with pin-prick test, and motor block was evaluated with modified Bromage scale. Surgery was initiated in patients with sensory block at T4-6 dermatome levels. Patients who experienced pain intraoperatively were administered 50 μg fentanyl via intravenous route. Those requiring additional doses of analgesics were regarded as inadequate block and were excluded from the study. Greater than 25% decrease from basal value, or a level below 90 mmHg in systolic arterial pressure was accepted as hypotension. When patients developed hypotension and/or nausea/vomiting, the amount of I.V. fluid infusion was increased in addition to nasal oxygenation. If hypotension persisted, 10 mg ephedrine was administered I.V. A heart rate below 50 bpm was accepted as bradycardia, and 0.5 mg atropine was administered I.V. in such a case. At the end of surgery, after skin closure, ultrasound (Esaote, Mod 7315 Italy) guided bilateral TAPB was performed routinely to the patients in Group TAPB. A linear probe was placed on the median axillary line over the iliac crest. When an appropriate image was captured, a 22 Gx 50 mm (PAJUNK®, SonoPlex Stim cannula, U.S.A) neurostimulator needle was inserted through external and internal oblique abdominal muscles. 20 ml of 0.25% bupivacaine was injected to each side over transversus abdominis fascia (Figure 1). Following TAPB procedure, all patients were transferred to the recovery room. Figure 1: TAPB block application. Patients transferred to the recovery room and then later to the obstetrics clinic were evaluated by an anesthetist who was blinded to the patient groups. After attaching patients to standard monitoring devices, VAS score was then assessed. Patients who had a VAS score at or above 4 were administered tramadol as 10 mg bolus dose. Following control of the pain (VAS score below 4), Patient-Controlled Analgesia (PCA) device was run. For PCA, 200 mg tramadol (contramal 100 mg/amp, Abdi İbrahim AS., Turkey) was added to 100 ml saline solution to create a tramadol solution of 20 mg/ml concentration. PCA was applied with the following parameters: bolus dose as 20 mg, lock-out interval as 10 min, and basal infusion rate as 20 mg/h. Patients with regressed motor block and stable hemodynamics were transferred to the ward. In order to assess the level of analgesia at the postoperative period, VAS score was recorded at the time of entry to the recovery room, exit from the recovery room, and at postoperative the 1st, 2nd, 4th, 6th, 12th and 24th h. The total amount of tramadol consumed was recorded at the postoperative 24th h. Additionally, patient satisfaction regarding pain management was assessed at postoperative 24th h (1: bad, 2: moderate, 3: good, and 4: excellent). Initiation and termination times of intraoperative and postoperative sensory and motor block, amount of fluid infusion, analgesics, sedatives, and vasopressors administered at the perioperative period were recorded. The sample size was determined using G Power 3.0.10 software. Since literature data suggested that opioid consumption was reduced approximately 50% with applied TAPB, the effect size was considered as 0.5. Sample size was found to be 51, when α error probability and power of the study were planned as 0.05 and 0.80, respectively. Statistical analyses of the study were performed with IBM SPSS (statistical package for social sciences 20, Chicago, USA) software. Descriptive statistics were expressed as mean and standard deviation. Comparison of normally distributed parameters between groups was performed using independent samples t-test. Comparison of non-parametric data (VAS) was performed using Mann-Whitney U test. ASA, gestational week, the spinal interspace used during intervention, level of maximum sensorial and motor block and satisfaction scores were all evaluated using the chi-square test. For all analyses, the level of significance was determined as p<0.05. There was no statistically significant difference between the groups regarding age, body weight, gestational week, and duration of surgery. The groups did not show any statistically significant difference regarding the amount of anesthetic substance injected to the spinal epidural space, time to achieve maximum sensory block, time to achieve maximum motor block, and regression time of motor block. In group TAPB, VAS scores at the time of entry to the recovery room, exit from the recovery room, and at the postoperative 1st, 2nd, 3rd, 4th, 6th and 12th h were significantly lower when compared to Group C (p<0.05) (Figure 2). 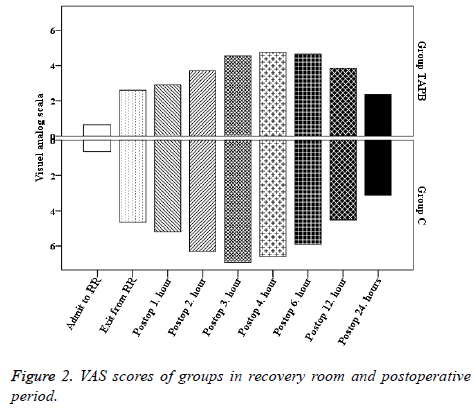 Figure 2: VAS scores of groups in recovery room and postoperative period. 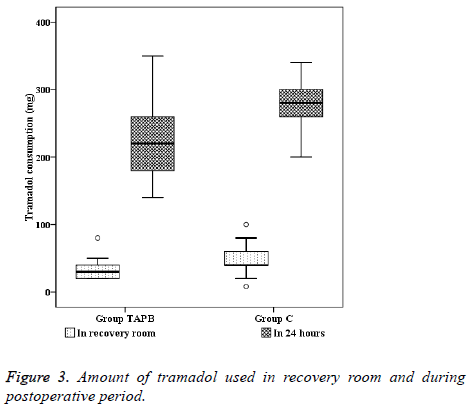 When we compared the amount of tramadol used in the recovery room and during the postoperative 24 h between the groups, they were significantly lower in group TAPB (32.50 ± 15.51 mg and 226.00 ± 66.44 mg, respectively) in comparison to group C (47.52 ± 19.15 mg and 280.80 ± 35.34, respectively) (p<0.05) (Figure 3). Patient satisfaction scores (1/2/3/4) assessed at the postoperative 24th h was significantly higher in group TAPB (0/4/8/8) in comparison to group C (4/10/9/2). Figure 3: Amount of tramadol used in recovery room and during postoperative period. Transversus abdominis plane block is among the newly described methods to provide analgesia following abdominal surgery . In this method, the local anesthetic agent is injected between the internal oblique and transversus abdominis muscles in order to achieve sensorial block of the whole abdominal wall. Several studies have shown the analgesic efficacy of this method [5,8]. As a result of technological advances, this method can be safely applied under ultrasonography guidance, making it a convenient method with ever increasing use . For that matter, in our study, we performed TAPB under ultrasonography guidance. Tran et al. injected 20 ml of aniline dye into the neurofascial plane under ultrasonography guidance, and examined the muscle structures and nerves that were stained with the dye. They stated that T10-L1 nerves were affected with 20 ml. volume, and that this technique could be limited to use in the lower abdominal surgery. Concentration may be adjusted according to the patient or condition. Rather than being dependent upon the concentration, this block is a volume-dependent method. Provided that adequate volume is administered, it is possible to achieve analgesia that lasts about 24-48 h. For that matter, we used 20 ml. of bupivacaine with 0.25% concentration in our study. In our study, we observed that ultrasound guided TAPB application in patients who underwent caesarian section under spinal anesthesia resulted in decreased pain, reduced opioid consumption at the postoperative period, and enhanced patient comfort. In their study involving patients who underwent caesarian section under general anesthesia, Tulubas et al. showed that US-guided TAPB application resulted in reduced 24 h morphine consumption and lower postoperative VAS scores. Similar to our results, studies that evaluated the efficacy of TAPB performed after spinal anesthesia have shown reduced VAS score and analgesic consumption associated with the procedure [5,11-13]. Fusco et al. have examined efficacy of TAPB after caesarian section underwent spinal anesthesia. In our study, TAPB was shown to be an effective postoperative analgesia method in accordance with their study . A meta-analysis that reviewed 7 studies involving TAPB after general anesthesia and 2 studies involving TAPB after spinal anesthesia concluded that TAPB application had a significant contribution in postoperative pain control in spinal anesthesia cases that do not involve the addition of intrathecal opioid injection. As for spinal anesthesia applications that involve the addition of opioids, studies showed no net effect of TAPB . A double-blind randomized trial that compared the efficacy of intrathecal morphine against TAPB showed that those who had intrathecal morphine injection had lower VAS scores at rest and during movement as well as reduced consumption of additional analgesics when compared to those who had TAPB; however, they experienced more side effects associated with morphine . In their meta-analysis including 312 cases, Abdallah et al. concluded that TAPB application can be conveniently performed in cases who present contraindication to intrathecal opioid administration. The other block in which TAPB is frequently compared is ilioinguinal-iliohypogastric nerve block. Kiran et al. have demonstrated that ilioinguinaliliohypogastric nerve block is inferior than TAPB lower segment cesarean section . Görkem et al. have compared TAPB with wound infiltration for postoperative analgesia after cesarean delivery. They demonstrated that TAP block better than wound infiltration . The most important evaluative criterion regarding patient satisfaction is the sensation of pain. Effective postoperative pain management has significance for this evaluation. Consistent with literature, in our study, patient satisfaction was significantly higher in the TAPB group [12-15]. Faiz et al. have compared lateral and posterior approaches to ultrasound guided TAPB to postoperative analgesia after underwent spinal anesthesia. They have demonstrated that posterior approach is superior to lateral approach especially in resting time . In our study, lateral TAPB approach has been applied. We investigated the postoperative analgesic efficacy of ultrasound guided transversus abdominis plane block performed with the purpose of postoperative analgesia in patients who underwent Caesarian section operation under spinal anesthesia in elective circumstances. We found that patients who had TAPB had a reduced amount of analgesic consumption both during recovery and by the end of postoperative 24 h, lower VAS scores and greater patient satisfaction. Ultrasound guided TAPB is a safe and effective method to be used for postoperative pain management in patients undergoing caesarian section, either as an alternative to or in conjunction with other methods. Frolich MA. Obstetric anesthesia. Morgan and Mikhails Clinical Anesthesiology New York: McGraw-Hill Education 2013; 843-876. Schyns-van den Berg AM, Huisjes A, Stolker RJ. Postcaesarean section analgesia: are opioids still required? Curr Opin Anaesthesiol 2015; 28: 267-274. White PF. The role of non-opioid analgesic techniques in the management of pain after ambulatory surgery. Anesth Analg 2002; 94: 577-585. White PF. The changing role of non-opioid analgesic techniques in the management of postoperative pain. Anesth Analg 2005; 101: 5-22. McDonnell JG, ODonnell B, Curley G, Heffernan A, Power C, Laffey JG. The analgesic efficacy of transversus abdominus plane block after abdominal surgery: A prospective randomized controlled trial. Anesth Analg 2007; 104: 193-197. Shibata Y, Sato Y, Fujiwara Y, Komatsu T. Transversus abdominus plane block. Anesth Analg 2007; 105: 883-885. Tran TN, Ivanusic J, Hebbard P, Barrington MJ. Determination of spread of injectate after ultrasound-guided transversus abdominus plane block: a cadaveric study. BJA 2009; 102: 123-127. Mc Donnell JG, Curley G, Carney J, Benton A, Costello J, Mharaj CH, Laffey JG. The analgesic efficacy of transversus abdominus plane block after ceserean delivery: a randomized controlled trial. Anesth Analg 2008; 106: 186-191. 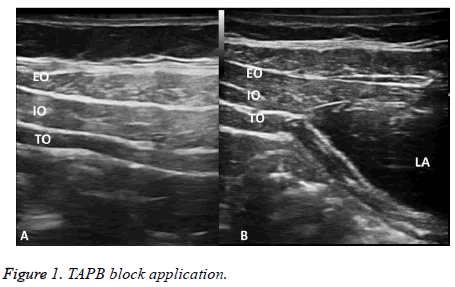 Hebbard P, Fujiwara Y, Shibata Y, Royse C. Ultra-sound-guided transversus abdominus plane (TAP) block. Anaesth Intensive Care 2007; 35: 616-617. Tulubas EK, Duman E, Cetingok H. Post-Op analgesic efficacy of transabdominal rectus plexus block with the aid of USG in cesarean section. Istanbul Med J 2013; 14: 271-275. Belavy D, Cowlishaw PJ, Howes M, Phillips F. Ultrasound guided transversus abdominus plane block for analgesia after caesarean delivery. Br J Anaesth 2009; 103: 726-730. Baaj JM, Alsatli RA, Majaj HA, Babay ZA, Thallaj AK. Efficacy of ultrason-guided transversus abdominus plan (TAP) block for post-cesarean section delivery analgesia. MEJ Anesth 2010; 20: 821-826. Abdallah FW, Halpern SH, Margarido CB. Transversus abdominus plane block for postoperative analgesia after caesarean delivery under spinal anaesthesia? A systematic review and meta-analysis. Br J Anaesth 2012; 109: 679-687. Fusco P, Cofini V, Petrucci E, Scimia P, Pozone T, Paladini G, Carta G, Necozione Z, Borghi B, Marinangeli F. Transversus abdominis plane block in the management of acute postoperative pain syndrome after caesarean section: a randomized controlled clinical trial. Pain Physician 2016; 19: 583-591. Mishriky BM, George RB, Habib AS. Transversus abdominus plane block for analgesia after Cesarean delivery: a systematic review and meta-analysis. Can J Anesth 2012; 59: 766-778. Loane H, Preston R, Douglas MJ, Massey S, Papsdorf M, Tyler J. A randomized controlled trial comparing intratekal morphine with transversus abdominus plane block for post-cesarean delivery analgesia. Int J Obstet Anesth 2012; 21: 112-118. Kiran LV, Sivashanmugam T, Kumar VRH, Krishnaveni N, Parthasarathy S. Relative efficacy of ultrasound-guided ilioinguinal-iliohypogastric nerve block versus transverse abdominis plane block for postoperative analgesia following lower segment cesarean section: a prospective, randomized observer-blinded trial. Anesth Essays Res 2017; 11: 713-717. Gorkem U, Kocyigit K, Togrul C, Gungor T. Comparison of bilateral transversus abdominis plane block and wound infiltration with bupivacaine for postoperative analgesia after cesarean delivery. J Turk Ger Gynecol Assoc 2017; 18: 26-32. Faiz SHR, Alebouyeh MR, Derakhshan P, Imani F, Rahimzadeh P, Ghaderi Ashtiani M. Comparison of ultrasound-guided posterior transversus abdominis plane block and lateral transversus abdominis plane block for postoperative pain management in patients undergoing cesarean section: a randomized double-blind clinical trial study. J Pain Res 2017; 11: 5-9.